Young adult science fantasy is a story type that has existed in various forms since the 1950s. The writing quality can vary, but the intention – to convey a vision where humanity has become an interstellar society always fires the imagination of impressionable readers. 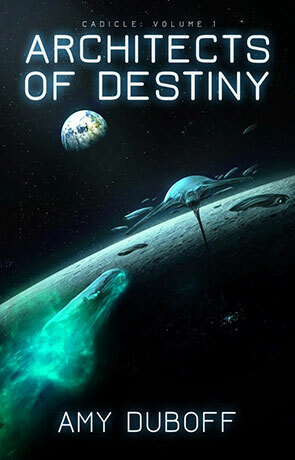 Architects of Destiny is a bold title for an escape into one such vision. Our protagonist, Cris Sietinen is heir to a powerful lineage Tararia, but chafes under the constrictions of his place, like most young men do as they get to that age and try to find their way. For Cris, burgeoning telepathic and telekinetic powers don’t help and nor does the neglect of his parents. DuBoff’s writing is a little shaky to start with some patterned anchors, but this quickly settles and becomes confident and consistent, holding the viewpoint and developing the narrative with skill. She has a tendency to overuse italic asides from her main character which could be mostly cut out as they don’t really add anything. But otherwise, the story develops at a brisk pace with a lot delivered and learned. We focus on the microplot (character story) for the most part and this becomes a vehicle towards the macroplot (world/interstellar conflict) as the story progresses. Our central character Cris is full of the flux of his age, making him interesting and annoying in equal measure. Some scenes invoke sympathy and identification, others reveal his brattishness. Here is a young man born to a life of privilege trying to make his way outside of the advantages that life can afford. In doing so, he manages pretty well, with few scrapes and bumps to speak of. By removing the privilege from Cris’ life so quickly, he becomes an every man for us and by allying his inexperience with the world to our own he establishes himself as our guide. It’s clear much of the time between Cris running away and being picked up by the Tararian Selective Servicen (TSS) is something of a fill, but actually this is the most interesting part of the book as we soak up DuBoff’s future society, although we always know the past will catch up with Cris at some point. A few plot seeds are sown; some good ones don’t get used, which is a shame. The pickup and recruitment to the TSS is a highlight scene of the book, although subsequent introduction to the academy and training is a familiar trope. However, this schooling is part of the expectation and experience of the target audience and as such provides a good opportunity to expand the cast, as much of the story thus far has revolved around Cris’ experience on the outside of things looking in. Duboff handles character exchange well. There is some swear word contrivance in the dialogue (‘Fock’, ‘Bomax’, ‘Stars’), but this doesn’t jar too much. Of more interest is the way in which she surprises us at times with the lines of argument her characters take. This is particularly true in key scenes with Banks, the TSS commander and Kate, another of the trainees who becomes Cris’ friend. The exercises to ‘train’ Cris are taken as an opportunity for DuBoff to detail her implementation of Clarke’s third law. The mechanics are shown here, which can be a positive, although the element of mystery around the TSS and their practice is sacrificed by doing so. Nevertheless this is a common practice where writers feel the need to ‘show their working’ and ultimately it comes down to reader preference. However, we do learn more about the wider political picture which serves up a different flavour of mystery. The jump forward from the end of part two to part three undermines a certain amount of the political tension established immediately before it, but we do get a sense of application from our protagonist, although, it might have been better to see more of his character change through experience. However, it does appear he’s escape from one controlled life directly into another. The final chapters of the novel do begin to feel like they are setting out the priorities for the sequel and making considerable use of the legacy established at the beginning. This is a little bit unfortunate as the most charming element about Cris is the down to earth way he approaches trying to forge his own path. The fact that he might be entangled in a wider web of intention that we haven’t much knowledge of does undermine this effort a bit and make the reader consider what’s actually been achieved from the start to the end of the story. The answer though is pretty clear as DuBoff has subtly established an engaging and accessible world in which to tell her bigger tale with plenty of hints as to what elements it will contain. Architects of Destiny achieves what it sent out to achieve in establishing a moreish series of good accessible science fantasy aimed at a young adult audience. This is a pacey and well written introduction which will stimulate imaginations. Written on 23rd May 2015 by Allen Stroud.